Two local authors, Keren McGinity and Anita Diamant, discuss the challenges and opportunities presented Jewish intermarriage and the blended families that result. When American Jewish men intermarry, goes the common assumption, they and their families are lost to the Jewish religion. In this provocative book, Keren R. McGinity shows that it is not necessarily so. She looks at intermarriage and parenthood through the eyes of a post-World War II cohort of Jewish men and discovers what intermarriage has meant to them and their families. She finds that these husbands strive to bring up their children as Jewish without losing their heritage. Marrying Out argues that the gendered ethnicity of intermarried Jewish men, growing out of their religious and cultural background, enables them to raise Jewish children. McGinity's book is a major breakthrough in understanding Jewish men's experiences as husbands and fathers, how Christian women navigate their roles and identities while married to them, and what needs to change for American Jewry to flourish. Marrying Out is a must read for Jewish men and all the women who love them. Keren R. McGinity is an educator and agent of change who specializes in Jewish intermarriage. University in St. Louis with a degree in comparative literature and earned a Master’s in American literature from Binghamton University in upstate New York. In 1975, she moved to Boston and began a career in journalism, writing for local magazines and newspapers, including the Boston Phoenix, the Boston Globe, and Boston Magazine. She branched out into regional and national media: New England Monthly, Yankee, Self, Parenting, Parents, McCall's, and Ms. Her feature stories and columns covered a wide variety of topics, from profiles of prominent people and stories about medical ethics, to first-person essays about everything from politics to popular culture to pet ownership to food. Diamant also wrote about contemporary Jewish practice for Reform Judaism Magazine, Hadassah Magazine, and jewishfamily.com. Her first book, published in 1985, was The New Jewish Wedding, a handbook that combines a contemporary sensibility, respect for tradition and a welcoming prose style. Five other guidebooks to Jewish life and lifecycle events followed: The New Jewish Baby Book; Living a Jewish Life: Jewish Traditions, Customs and Values for Today’s Families: Choosing a Jewish Life: A Handbook for People Converting to Judaism and for Their Family and Friends; Saying Kaddish: How To Comfort the Dying, Bury the Dead and Mourn as a Jew, and How to Raise a Jewish Child. In 1997, Diamant published her first work of fiction. Inspired by a few lines from Genesis, The Red Tent tells the story an obscure and overlooked character named Dinah, the only daughter of Jacob and Leah. The Red Tent became a word-of-mouth bestseller thanks to reader recommendations, book groups, and support from independent bookstores. In 2001, the Independent Booksellers Alliance honored The Red Tent as the "Booksense Best Fiction" of the year. The Red Tent has been published in more than 25 countries world wide, including Australia, England, Finland, France, Germany, Holland, Israel, Japan, Korea, Lithuania, Portugal, Spain, and Sweden. In 2014, the novel was adapted as a two-part, four-hour miniseries by Lifetime TV. "Things We Don’t Talk About: Woman’s Stories from The Red Tent" is a groundbreaking 72-minute documentary film by award winning filmmaker Isadora Gabrielle Leidenfrost, PhD. Spontaneous and organic, a Red Tent is a red textile space where women gather to rest, renew, and often share deep and powerful stories about their lives. The Red Tent movement is changing the way that women interact and support each other by providing a place that honors and celebrates women, and by enabling open conversations about the things that women don’t want to talk about in other venues. Things We Don’t Talk About weaves together healing narratives from inside The Red Tent to shine a spotlight on this vital, emergent women’s tradition. The film provides us an opportunity to remember, to listen, to know, and to find what it is we need to bring back to our communities to help awaken the voices of women. For more information about “Things We Don’t Talk About” and to view the clips from the film visit: www.redtentmovie.com Advanced tickets are $15 available in person at Charis Books and More or online at https://www.eventbrite.com/e/things-we-dont-talk-about-womens-stories-from-the-r... Tickets are $20 at the door (cash, check, or credit card). This event takes place at The First Existentialist Congregation of Atlanta. Proceeds go to support the work of Charis Circle, The First Existentialist Congregation's Social Justice Guild, and the filmmaker. From the New York Times bestselling author of The Red Tent and Day After Night, comes a character written with such powerful emotional resonance that you will hurt when she hurts and rejoice when she rejoices. That character is Addie Baum, born in 1900 to immigrant parents. The novel is framed as 85-year-old Addie telling her life story to her 22-year-old granddaughter, Ava, who has asked her, "How did you get to be the woman you are today?" As a young Jewish woman growing up in Boston in the early twentieth century, Addie's intelligence and curiosity take her to a world that would've shocked her parents - a world of short skirts, movies, celebrity culture and new opportunities for women. Addie's controversial desires (for the times) complements and contrasts to Ava's own life desires, including her wish to become a rabbi. The Boston girl, written with the same historical detail as Diamant's previous books, is a moving portrait of one woman’s complicated life in twentieth century America, and a fascinating look at a generation of women finding their places in a changing world. Anita Diamant is the bestselling author of the novels The Red Tent, Good Harbor, The Last Days of Dogtown, and Day After Night. An award-winning jouranlist whose work has appeared in The Boston Globe magazine and Parenting, she is the author of six nonfiction guides to contemporary Jewish life. Alice LaPlante is the author of five books, including Turn of Mind, a New York Times, NPR, and American Independent Booksellers Association bestseller. She teaches creative writing at both Stanford and San Francisco State. Join the event on Facebook! From the New York Times bestselling author of The Red Tent and Day After Night comes an unforgettable coming-of-age novel about family ties and values, friendship and feminism told through the eyes of a young Jewish woman growing up in Boston in the early twentieth century. Addie Baum is The Boston girl, born in 1900 to immigrant parents who were unprepared for and suspicious of America and its effect on their three daughters. Growing up in the North End, then a teeming multicultural neighborhood, Addie's intelligence and curiosity take her to a world her parents can't imagine--a world of short skirts, movies, celebrity culture, and new opportunities for women. Addie wants to finish high school and dreams of going to college. She wants a career and to find true love. Eighty-five-year-old Addie tells the story of her life to her twenty-two-year-old granddaughter, who has asked her "How did you get to be the woman you are today?" She begins in 1915, the year she found her voice and made friends who would help shape the course of her life. From the one-room tenement apartment she shared with her parents and two sisters, to the library group for girls she joins at a neighborhood settlement house, to her first, disastrous love affair, Addie recalls her adventures with compassion for the naive girl she was and a wicked sense of humor. Written with the same attention to historical detail and emotional resonance that made Anita Diamant's previous novels bestsellers, The Boston girl is a moving portrait of one woman's complicated life in twentieth-century America, and a fascinating look at a generation of women finding their places in a changing world. The Old St. Pat's Book Club meets at 7 p.m. to discuss The Red Tent By Anita Diamant. Anita Diamant is the daughter of two Holocaust survivors. She grew up in Newark, New Jersey and Denver, Colorado. She attended the University of Colorado for two years, then transferred to Washington University in St. Louis, where she earned a bachelor’s degree in comparative literature in 1973. She obtained a master’s degree in English from the State University of New York at Binghamton in 1975. She lives with her husband and daughter near Boston. Diamant began her writing career as a freelance journalist and over the years, she has written for the Boston Globe, Boston Magazine, Yankee, Self, Parenting, Parents, McCalls, Ms., and others. She's the author of six books about contemporary Jewish practice, one collection of autobiographical essays (Pitching My Tent) and three prior novels. The Red Tent (1997), her first novel, was a national bestseller. 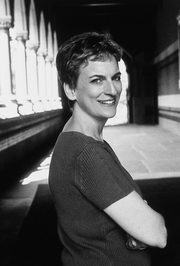 Anita Diamant is currently considered a "single author." If one or more works are by a distinct, homonymous authors, go ahead and split the author. Anita Diamant is composed of 12 names. You can examine and separate out names.